Ever since terrorists started using the internet, amateur crusaders, lawmakers and others have tried to fight back, pressuring technology companies to shut out the militants. So it was only a matter of time before the war on terrorist media went social. On Thursday, an Israeli legal advocacy group Shurat HaDin threatened Twitter with a lawsuit if it didn’t remove the accounts of U.S.-designated Foreign Terrorist Organizations such as the Lebanon-based Hezbollah and Somalia’s al-Qaida-linked al-Shabaab. Though a legal tussle may give the folks at Twitter a headache, the terrorists behind the Twitter accounts probably aren’t sweating a potential shutdown. The lawsuit threat is based on a Supreme Court case, Holder v. Humanitarian Law Project, which upheld a controversial portion of the Patriot Act banning support to terrorists. The prohibited forms support include traditional forms of help such as money and guns, extending to “any … service, … training, [or] expert advice or assistance.” Critics argued that the definition encroached on free speech rights and criminalized dialogue with terrorist groups. The lawsuit wouldn’t apply to one of Twitter’s more active insurgent accounts, the Taliban’s @alemarahweb, since the group isn’t a U.S.-designated Foreign Terrorist Organization. But even if Shurat HaDin’s campaign is ultimately successful in shutting down terrorist Twitter account, they’ve got alternatives. Terrorists now communicate through an array of different media, including videos, music, magazines in .pdf format, and even video games. If denied access to a brand name social media sites, there’s an alternative distribution infrastructure for terrorists to spread their propaganda. Jihadi forums already can act as a kind of watered-down version of Facebook, with users able to private message each other, share links and discuss issues of interest. File hosting sites can offer ready (if not speedy) access to videos in lieu of YouTube. And that’s to say nothing of the kind of resources that state-sponsored Hezbollah has in its media aresenal. The group already has its own satellite television channel. The loss of an official Twitter account would by no means silence terrorist groups. Instead, it would make them go through the inconvenience of relying on less centrally-accessible sock puppet accounts or fanboys to repost messages and links from other outlets. Shabaab’s Twitter spokesman already seems to have latched on to the idea, tweeting the grandiose boast “How many accounts would #US government be able to close before realizing the futility of their attempt? They need a team now to monitor HSM!” It’s a strategy the Taliban used after its official YouTube channel became a lightning rod. When Google removed some of the group’s videos, the Taliban simply started embedding links on its website to fan-uploaded propaganda flicks. It’s also worth noting that the campaigns against terrorists on the Internet tend to focus on newer services. The British government and Senator Joseph Lieberman berated Google for hosting videos of Anwar al-Awlaki, but neither seemed to take much notice that the group he was affiliated with, al-Qaida in the Arabian Peninsula (AQAP), was advertising a Gmail address for fans to use in the front pages of its Arabic language magazine. It’s not clear that the newer services offer any more advantage to terrorists than older ones. Insofar as one believes that Anwar al-Awlaki’s communications with the Fort Hood shooter helped push him further towards violence — a contested claim, to be sure — those conversations took place through a regular email address advertised on Awalki’s old-fashioned blog. 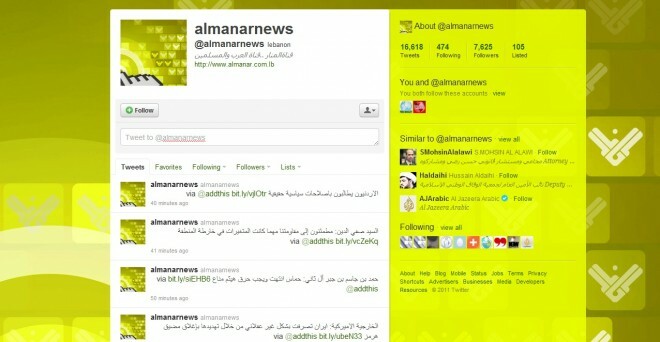 Don’t hold your breath waiting for propaganda from Shabaab, Hezbollah and other groups to be cleansed from Twitter. Jihadi media is still available on YouTube, even after a high profile pressure campaign against it, showing just how hard it can be to scrub terrorists from social media.